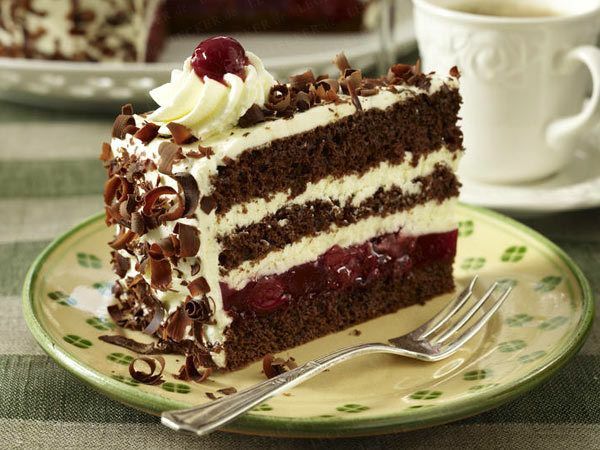 Black Forest Cake is a staple in the German Kitchen. 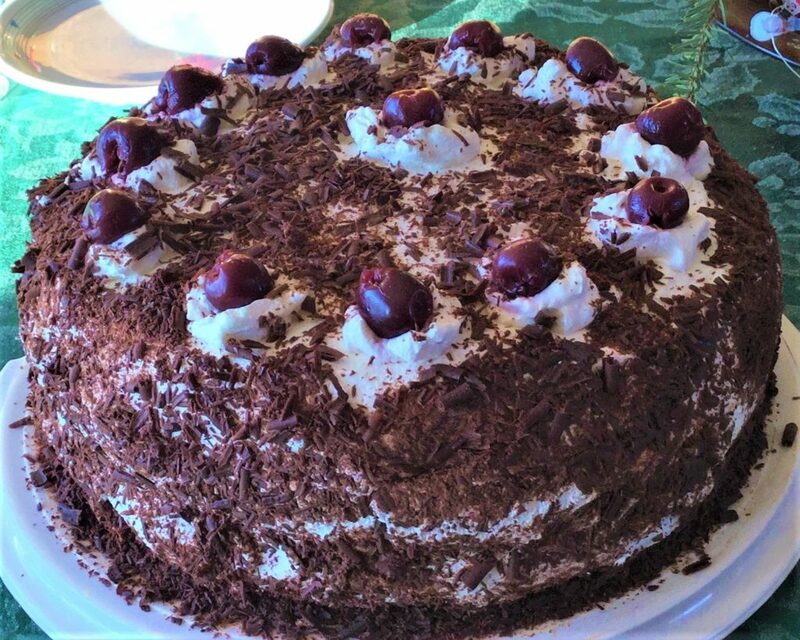 Real Black Forest Cake (Schwarzwaelder Kirsch Torte) needs lot’s of whipped cream, chocolate shavings, cherries and of course Cherry Brandy. It’s a little bit more complicated and should be prepared with some time to spare. Just to be clear, I don’t have the patience to do this. My husband is the one who makes this delicious cake! Separate egg yolk and white. Beat egg-white and salt to a firm mass (check with knife for correct firmness). Carefully pour in the sugar while beating the mass. Carefully fold in the egg yolks. Mix the flour, starch, baking powder, baking soda, and cocoa and sift over the egg mix. Fold the mixture in. Lay parchment paper on the bottom of a springform pan (26 cm / 10-11 in.). Grease the bottom and frame of the pan with butter to prevent sticking. Fill in the mass and spread evenly. Bake 25 to 30 minutes (toothpick test). Let it completely cool down. Fill cherries into a sifter and let the juice completely drip off (collect the juice). Take 13 (!) cherries aside for later decoration of the top of the cake. Remove the cooled-down dough from the pan and slice 2 times to result into 3 layers of dough. Using a tablespoon distribute cherry brandy as desired to all layers (mostly on bottom layer). Powder layer 1 and 2 with vanilla pudding. Cover lightly with chocolate shavings. Add a little cherry brandy to the collected cherry juice. Heat to boiling point, add some vanilla pudding and/or starch so the juice can reach firmness. Add cherries back in. Cover bottom layer with cherries and the juice. Use any leftover cherries and juice for the second layer. Let cool down completely! Whip the whipping cream to a firm mass. Spread a thick (1.5 cm / ½ in) layer on the bottom dough. Carefully slide on the second layer. Add another layer of whipped cream. Slide on the top layer. Cover whole cake with whipped cream. Add little tips on the top layer: 12 around the cake (for each slice to be cut) and one in the center. Add the separated cherries onto these tips. Cover whole cake (top and sides) with chocolate shavings as desired. Keep the cake in the fridge for 12 to 24 hours before cutting (this will let the flavors soak through and enhance the overall taste). Use a wet knife when cutting! Enjoy!